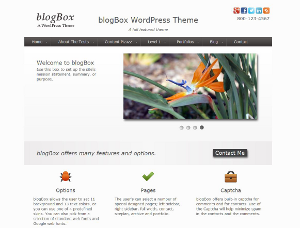 blogBox is a full featured responsive theme that provides the user with numerous options for background colors, text colors, font styles, including skins. There are template pages for Portfolio, Left Sidebar, Right Sidebar, Full Width, Home Page, Archive, Siteplan, and Contact. Contact and comments section include an optional captcha for spam control. Detailed user documentation is available at the demo site.